Installing Revealbot is super simple. Once done, you'll be able to track your ad performance right in your team's Slack, set automated rules, alerts and custom reports. Let's get started! It's really straightforward – just go to the sign up page and create your Revealbot account using your email or Slack. 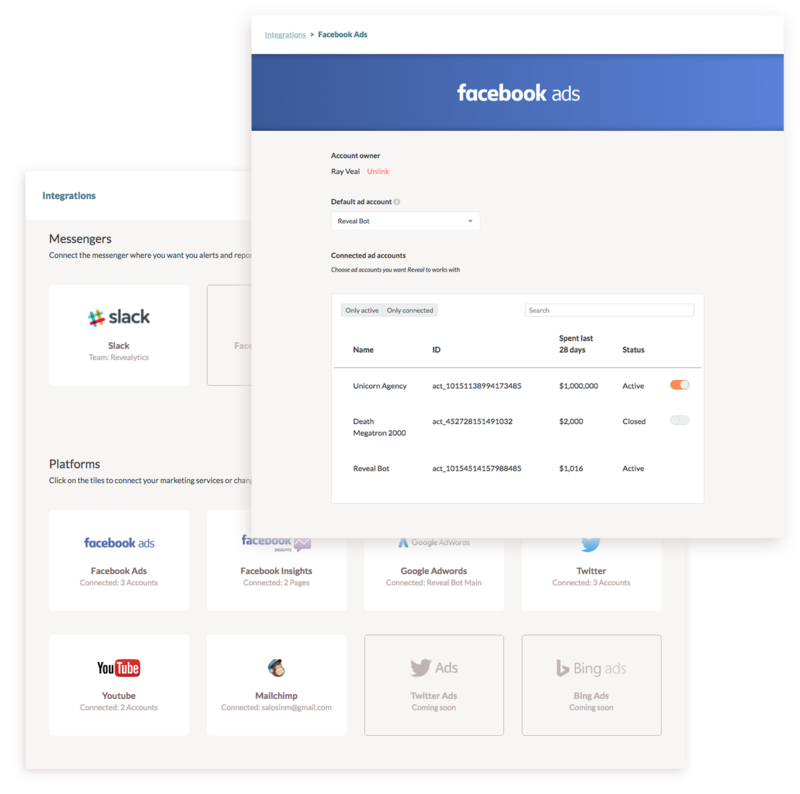 You can connect your Facebook Ads, Facebook Insights, Google AdWords and Analytics, YouTube, Twitter and MailChimp accounts to Revealbot. On Integrations page hit the corresponding tab and authorize access to your account. If you have multiple ad accounts associated with your Facebook/Google account, you'll see them in the list. Toggle on the ad accounts you want to connect to Revealbot. And you're all set! You set the rules and conditions for your ads to make Revealbot manage your ads for you. You can set trigger conditions for your ads. Once they are met, you and your team will get an alert to Slack or email. You can build custom periodic reports on your ads performance and get them in Slack and/or email. Connect your Facebook pages on the insights tab and promote page posts automatically based on their organic performance. Create and launch ad campaigns mixing different creatives, audiences and other parameters.